Ever since Cristiano Ronaldo became a professional football player, one of his biggest concerns has always been to build the best physique possible to maximize his performances and dominance on the football fields. 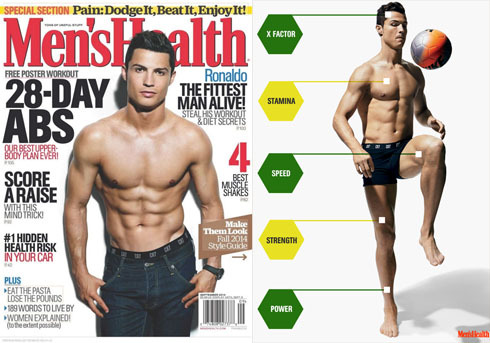 His body has gone through a massive change and development over the past 10 years and we can't really say it's been much of a surprise when we saw such a reputable magazine such as Men's Health distinguishing Ronaldo as the fittest man alive. The Real Madrid forward, who was also featured on the front cover of the magazine's US edition in August, has revealed that he never works his body purely for aesthetic reasons, but rather to help him improving his game on the pitch. The magazine starts by highlighting a few interesting facts about Ronaldo. According to Men's Health, the Real Madrid star runs an average of 10km per game. He also does close to 33 sprints during the 90 minutes of a football match. When jumping, he can raise himself from the ground up to 80 centimeters. As for his shooting power, his strikes can go as fast as 130 km/h. Those were just a few of the points outlined by Men's Health when trying to justify why they have picked Cristiano Ronaldo as the fittest man in the world. Cristiano Ronaldo: "I don't work out as much as I do just to look good for photoshoots and get myself featured on magazines. I do it to be better at my job, which is playing football. In my view, a professional football player has the obligation to always be healthy and strong, as well as ready to deliver at his best in any game of the season", started by explaining the former Manchester United winger, who has kicked off his pre-season training with Real Madrid on July 26, while the Merengues were still on tour in the United States. Ronaldo: "My main concern is to always be well prepared for training and competition and in order for that to happen, I never focus on a single part of my body. I prefer to work out my whole physique and I'm well aware of how important the mental aspect is to get the results we're hoping for as we try to improve our physique...", remarked the 29-year old forward when talkingn about a few interesting points of his training plan. In the meantime, Cristiano Ronaldo keeps training in Valdebebas, as Real Madrid gets ready for taking on Sevilla, in the UEFA Super Cup final. The match will take place in Cardiff (Wales) on August 12, and Carlo Ancelotti is certainly a happy man for already having all the first team players at his disposal, including the new signings, Toni Kroos and James Rodríguez, as well as the FIFA World Cup finalists, Angel Di María and Sami Khedira. Cristiano Ronaldo next game for Real Madrid will be against Sevilla, in the UEFA Super Cup final, scheduled for August 12. You can watch Juventus live stream, Real Madrid vs Sevilla, HJK Helsinki vs Barcelona, Arsenal vs Manchester City, and Besiktas vs Chelsea, all matches provided from our soccer live streaming pages.